Chris "Elio" Eliopoulos is an illustrator and comic artist from Chicago, IL. He has been drawing since he can hold a pencil and has continued on to become a graduate of Columbia College Chicago with a bachelor in fine arts. 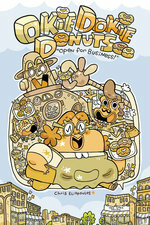 His work references mid-century print, design and advertising; UFOs, donuts, and old cranky men. Visit him on the web at www.eliohouse.com!